Louisiana Channel, a website affiliated with The Louisiana Museum of Modern Art in Denmark, has produced a video focusing on the building at 41 Cooper Square. Louisiana Channel calls it an "iconic building" that "shines like a diamond in the rough, transparent, light, and extremely cool." 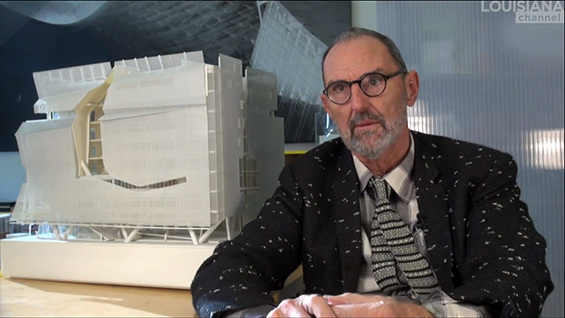 During the ten-minute video, architect Thom Mayne of Morphosis discusses his intentions behind the building's aesthetics, how it relates to the local communities and expresses the culture of The Cooper Union. "When I got the commission it was loaded with different directions," Mayne says in the video over panning shots of the building's interior. "It's an institute that is unique in [its] connection to engineering, architecture and art and it's about the relationship of those disciplines. It's very personal. It's a small place that is about the Socratic method of thinking and talking between people. ... It became a wonderful project [working] with an institute dealing in intellectual creative capital. And New York is nothing more than this incredible intensity of intellectual creative capital. And we are putting that to the street. We are contributing to that."